Answering calls from the Ashdown community for a distortion pedal tailored for modern bassists, we designed the Drive Plus, a pedal with the power to strike fear into the heart of the dirtiest of guitar riffs and give our thin-string brothers something to think about. Capable of taking your bass sound from a slight grunge through to high gain meltdown, the Drive Plus lets you add distortion to the high and low frequency component of your bass signal individually, so you can fuzz the top end and leave the low end cleaner or vice versa. This lets you sculpt unique powerful distorted tones that preserve the core tones you need to fit in the mix. To get the best results we found that different distortion types were needed for the different frequency bands. 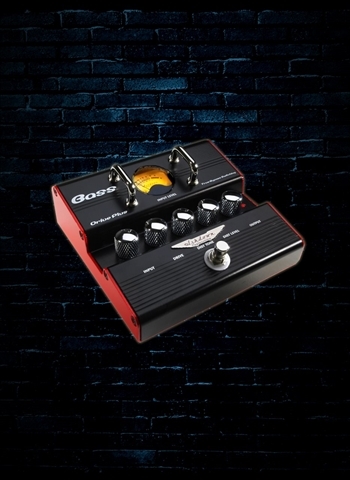 The Drive control sets the amount of distortion, Distortion Tone adjusts its character and Distortion Level balances the amount of the effect with the clean bass signal.